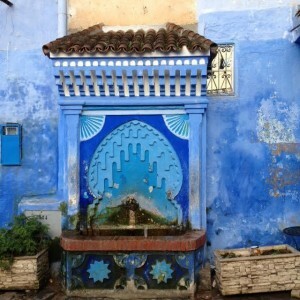 We meet our driver for the ride to Chefchouen, or Chaouen as the locals call it. 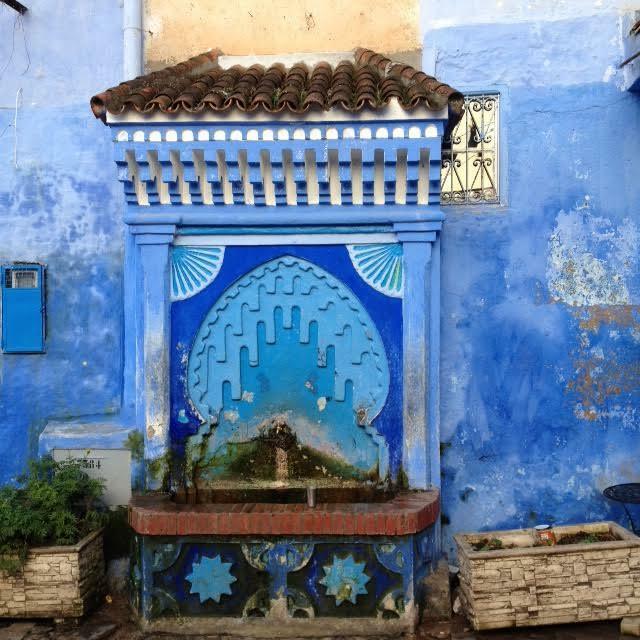 Wedged into the foothills of the Rif Mountains in northern Morocco, Chefchouen was founded in 1471 to protect against Portuguese invasions. It was settled shortly later by Muslims and Jews fleeing the Spanish “Reconquista” in Andalucía. Our drive is four hours. We arrive after dark. We wake to the pre-dawn symphony of muezzins calling people to prayer. This medley is unlike anything else—ancient and immediate, holy and deeply rooted in community. Stepping outside, we are greeted by a bouquet of smells: the communal oven where women and children come to bake the day’s bread, the admixture of cinnamon and turmeric wafting from cafes, smoke curling from unfiltered cigarettes, and kif. The visual tableau overwhelms. Morning is well underway; Chefchouen’s ancient streets teem with people. The streets are too narrow for anything beyond foot traffic and the occasional donkey hauling gas canisters or cases of Coca-Cola. Most astonishing is the color blue. Chefchouen is a blue town. 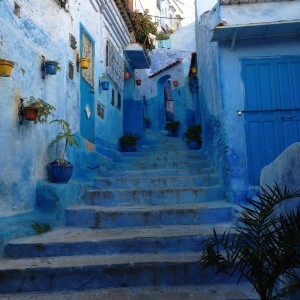 Houses are rinsed in a spectrum from azure to cerulean, a feast of color intensified by Moroccan sunlight. We walk uphill to Chefchouen’s medieval city wall. A twenty-minute climb gains nothing on the soaring highlands. Several elderly Berber women walk down the side of a mountain on the dirt path toward town. They wear traditional red and white striped garments. Some have additional brightly covered fabric tucked in at the waist; some wear the multi-colored pompom hats native to the Rif Mountains. A few have head coverings of yellow terrycloth towels. It seems these women are subsistence farmers; they carry sacks on their backs filled with produce to sell at the market below. They also carry laundry. 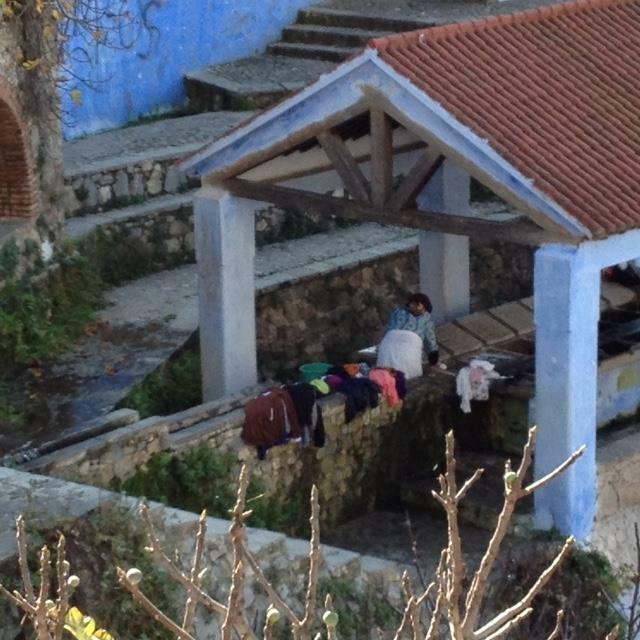 There’s a spring below the wall with an open structure containing massive wooden sinks for washing clothes. 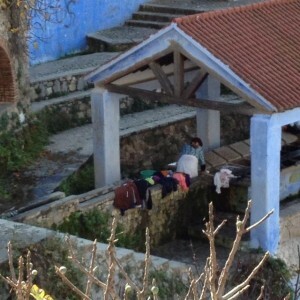 On this particular morning, two women are doing laundry. My observation is that it’s more than the family’s weekly wear. One woman kneels, scrubbing two sizeable rugs spread on the stone slabs next to the communal sinks. I know what I’m seeing at the spring in Chefchouen, but what am I looking at? In the context of walking several hours to carry a load of carrots to market or traveling on foot down a mountain to wash clothes, my energized conversations with colleagues and friends about feminism in America seem oddly beside the point. I reflect on laundry back home. In twentieth century Philadelphia, my grandmother washed clothes in a copper washtub that my father describes as oval, nearly a yard long and two feet high. MomMom boiled the clothes in soap and water, using a scrub board for resistant stains. After rinsing, she removed excess water by hand, or with a wringer, then hung the clothes to dry on a clothesline. MomMom was a small woman with four large children—two boys and two girls—and myriad household responsibilities. Despite meager schooling (she did not complete sixth grade), MomMom had a passion for education and for fairness. In the 1920s and 30s, she made sure her boys knew how to wash dishes and mop floors. Nevertheless, she washed their laundry when they left for college. They sent their dirty clothes home once a week in boxes designed for that purpose and she returned fresh, clean clothing in those same boxes. I’m told that was the custom. With the purchase of my parents’ first house in 1955, came a washing machine. My mother was a professional editor who worked at home, often at the dining room table. It was not unusual for that table to be covered in sets of galleys, at least three large dictionaries, and a clutch of sharpened pencils at the ready. In addition to her editorial responsibilities, my mother was in charge of the household wash. Like MomMom, my mother had four children. Laundry, however, was not the chore it was for her mother-in-law. My mother couldn’t understand why people minded doing it when all you had to do was throw the clothes in the machine and turn it on. My mother also had a dryer. When the clothes came out—warm and full of static—she dumped them on the dining room table. I re-consider that image for the first time: sheets and towels, my sisters’ and my underwear, my father’s tee shirts and jockey shorts, all piled on top of whatever manuscript my mother was editing at the time. A female body completely veiled in white cloth, her face completely concealed, only a hole left free for her eyes… All of us from the world of the shadow women, reversing the process: We are the ones finally who are looking, who are the beginning. The Berber-Algerian-French writer/filmmaker Assia Djebar (nom de plume for Fatima-Zohra Imalayen) was a devout Muslim and a western-educated woman. She was a member of the intelligentsia, a university professor, and an expatriate deeply tied to home. She wrote mostly in French; only late in her life in Arabic. Like the veiled woman above, Djebar looked from the outside in and the inside out. In Djebar’s So Vast the Prison, Arab women face Europe, then look toward home, and then turn toward Europe again. Here is Djebar’s description of another passage by boat, an Algerian mother and daughter sailing to France to visit their son and brother imprisoned for political activities. “You possess only what will not be lost in a shipwreck,” writes El Gazali, a revered Muslim theologian, jurist, and mystic quoted in Tahir Shah’s In Arabian Nights. Shah left a comfortable life in London to move his family to Casablanca. His tales of refurbishing a Casablancan mansion—antic and maddening and in vivid contrast to his ordered life in England—are delightfully recounted in The Caliph’s House. Shah’s In Arabian Nights weaves the centrality of storytelling in Moroccan culture into the search for Shah’s own, personal story. 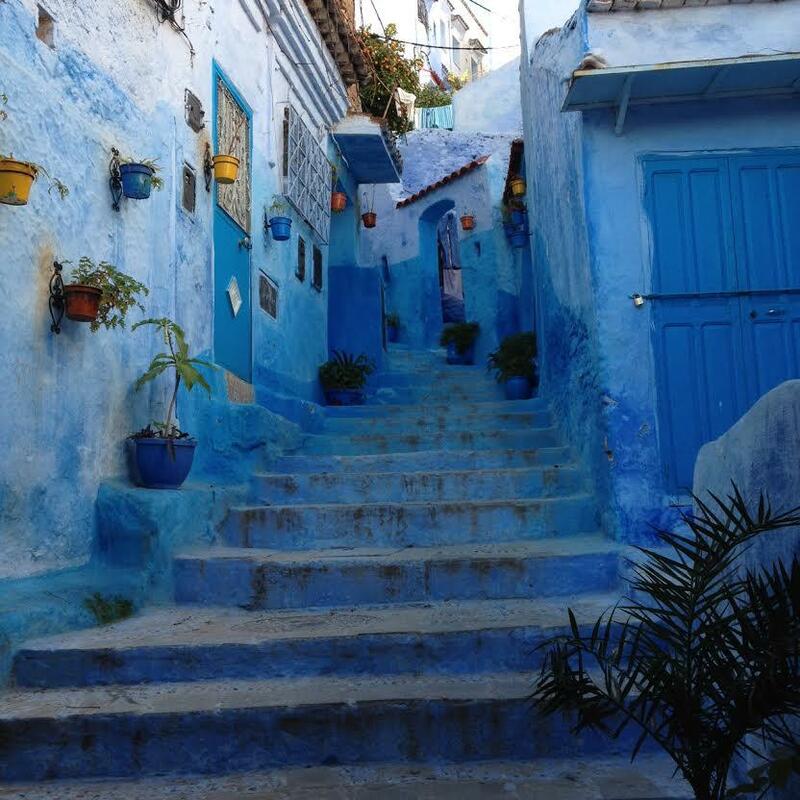 “‘The stories of Morocco are like a mirror,’” he learns from his friend and mentor, Dr. Mehdi. Back in America, I tend to split laundry responsibilities with my husband. My daughters, when they are home, prefer to do their own. In the course of writing this essay, I’ve made several trips to the washer and dryer. I now understand that when I was growing up, the dining room was my mother’s office; the table on which she folded laundry, her desk. MARTHA ANNE TOLL's essays have appeared in NPR, The Millions, Narrative Magazine, Tin House blog, and Washington Independent Review of Books. Her fiction has appeared in Yale's Letters Journal, Inkapture Magazine, Poetica Magazine, Referential Magazine, and Wild: A Quarterly. She is completing a novel--working title, The Three Muses--a love story between a Holocaust survivor and a ballerina. Martha is the executive director of a social justice foundation that focuses on preventing and ending homelessness and on criminal justice reform, particularly abolishing the American death penalty. She lives just outside of Washington, DC. Please visit her at www.marthaannetoll.com and tweet to her @marthaannetoll. Thank you Martha for this beautiful rumination. 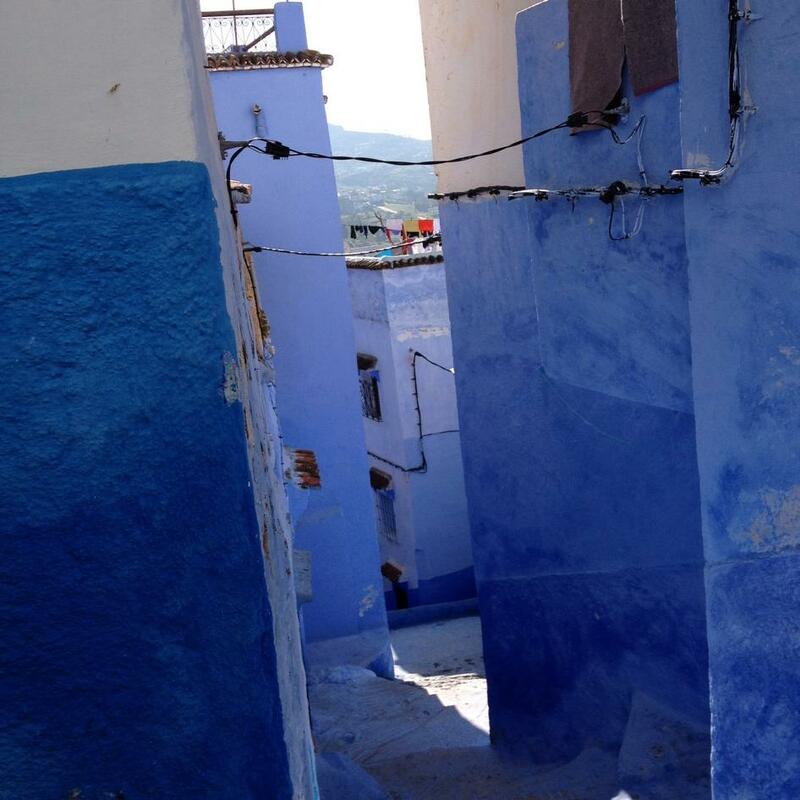 I love the idea of everything awash in blue, from mountain towns in Morocco to the laundry billowing over your mother’s editorial space – evocative and reflective. A lovely reflection that gets at the complexity in simple things. I love the way this moves between lived experience of Tangiers and reflections on reading, between the present day to the familial legacy. Our mothers have many desks. Martha–thank you for this lovely stroll, through your thoughts and photos.